We’d love your help. Let us know what’s wrong with this preview of Ruby on Rails 3 Tutorial by Michael Hartl. Using Rails 3, developers can build web applications of exceptional elegance and power. Although its remarkable capabilities have made Ruby on Rails one of the world’s most popular web development frameworks, it can be challenging to learn and use. 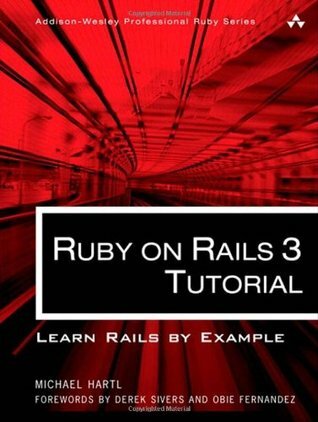 Ruby on Rails™ 3 Tutorial is the solution. Leading Rails developer Michael Hartl teaches Rails 3 by guiding you through the development of your own complete sample application using the latest techniques in Rails web development. Drawing on his experience building RailsSpace, Insoshi, and other sophisticated Rails applications, Hartl illuminates all facets of design and implementation—including powerful new techniques that simplify and accelerate development. To ask other readers questions about Ruby on Rails 3 Tutorial, please sign up. Recommends it for: New Rails developers, or developers seeking a Rails refresh. I've nearly completed the 3.2 version of this tutorial as a refresher and update for my Rails experience. As long as you understand what this book offers, you'll probably be happy with it. Michael Hartl has delivered a thorough, easy-to-follow tutorial that is quite readable, and will give you a decent overview of what it's like to write a Rails application and pick up a few well-recommended tools along the way (RSpec, Bootstrap Framework, Factory Girl). What it won't do is spend a lot of time wal I've nearly completed the 3.2 version of this tutorial as a refresher and update for my Rails experience. What it won't do is spend a lot of time walking you through lots of alternatives, explaining how the technology works, what your other choices are. All of those things would probably be a distraction to just getting an app built if you're new to Rails. Nice tutorial for absolute beginners with Ruby and Rails, or even with web developing. The biggest value of this book is the fact, that author keeps "T" principle from TDD. But there is also one major vice - Michael Hartl forgot about one part of the TDD: Refactoring. He starts every step with failing test, and he's going through the implementation, but with final design and clear code. It would be a big help for newbie programmers if book would cover refactoring topic, after EVERY new feature. M Nice tutorial for absolute beginners with Ruby and Rails, or even with web developing. The biggest value of this book is the fact, that author keeps "T" principle from TDD. If you're starting to learn Rails, follow the 3.2 book online. This is a good intro Rails 3.0 book. I had a break from Rails and when I last worked with Rails it was version 1.4. If you already know Rails pretty well this book is too basic, but it's still a good refresher if you've been away from it. It highlights all the elegant things about Rails very well. 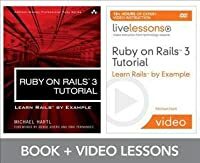 * Free website that includes the en If you're starting to learn Rails, follow the 3.2 book online. * RSpec examples - this book sticks pretty closely to Test-Driven Development. There's a fine line between having good tests and having excessive tests, and this book errs on the excessive side, which is probably good for an introductory book. This is a good resource but not a great place for an absolute beginner to start. The 3.2 version is better then the older one, however it is easy to get lost or get errors, and not know where to pick up. Just finished going through the free online version and it's in contention for the best programming book I've ever read. I recommend this book to anyone with programming experience looking to understand the Ruby on Rails stack. If you're new to programming, I'd recommend starting more with codeacademy or an online resource that handles all the environment setup stuff, and then come back to this book after you have your feet wet. The content is, on the whole, fairly well explained, getting concept Just finished going through the free online version and it's in contention for the best programming book I've ever read. I recommend this book to anyone with programming experience looking to understand the Ruby on Rails stack. If you're new to programming, I'd recommend starting more with codeacademy or an online resource that handles all the environment setup stuff, and then come back to this book after you have your feet wet. The content is, on the whole, fairly well explained, getting conceptual where necessary and letting you know when you don't have to think too hard about a certain concept just yet. The online format was filled with useful links to dig deeper into certain areas. The editing was also great, I found only one instance where it seemed like the code was out of order with the testing. There is quite a bit of legwork involved in getting to know your environment, but I, as the authored warned I would, actually ended up appreciating the amount of time spent with Git and Rails before actually programming. The author doesn't miss a single detail, and all the explanations are very straightforward. He's obviously knows his stuff, not only about Ruby on Rails. The guy is a Harvard graduate, and an award-winning theoretical and computational physics professor at Caltech. And here is writing a basic Rails tutorial, so it's obviously a passion. If you want to learn how to build a basic web application in Rails, and hone your programming technique in the process, this is an excellent guide. Using TDD (Test-Drivin-Development) from the outset, along with Git version tracking, this tutorial takes you through each stage of planning and developing a Twitter-like app. There is not much energy expended on any particular topic, but the pace of progress is steady and the exercises are challenging enough to engage active learners without being un If you want to learn how to build a basic web application in Rails, and hone your programming technique in the process, this is an excellent guide. Using TDD (Test-Drivin-Development) from the outset, along with Git version tracking, this tutorial takes you through each stage of planning and developing a Twitter-like app. There is not much energy expended on any particular topic, but the pace of progress is steady and the exercises are challenging enough to engage active learners without being unnecessarily difficult so as to prohibit the uninitiated. It would be helpful to have some knowledge of programming concepts and terminology before starting, but in general most of the problems are accessible to novice programmers. Intermediate-level Ruby developers will find his emphasis on best practices insightful. This is properly one of the best programmer books I have read. It takes you from zero to having strong foundation of Ruby on Rails, Test driven development with RSpec, how the Model View Controller pattern actually works, how to use GIT (version control) whilst building a basic web app. With peaks and introductions to whole bunch of other stuff giving you a taste so you can choose to explore further. It is free online which is amazing and whats more it is even regularly updated on line. I bought This is properly one of the best programmer books I have read. It takes you from zero to having strong foundation of Ruby on Rails, Test driven development with RSpec, how the Model View Controller pattern actually works, how to use GIT (version control) whilst building a basic web app. With peaks and introductions to whole bunch of other stuff giving you a taste so you can choose to explore further. It is free online which is amazing and whats more it is even regularly updated on line. I bought the first edition and never got to and and then bought the second edition. I have no issue with buying the books out of respect for what Michael Hartl and the community have pulled together. The best! This book is the most clear, understandable, and implementable of all the tutorial books I have been reading for the last month. He explains what is required, why, and how. The theory is explained in a way that is clear and more resources are cited for those who want to delve deeper into the programming languages, development environments, servers, scaffolding, version control theory, or gemlibraries. The examples are simple but easily scalable. Hooray! The author is someone who can use The best! This book is the most clear, understandable, and implementable of all the tutorial books I have been reading for the last month. He explains what is required, why, and how. The theory is explained in a way that is clear and more resources are cited for those who want to delve deeper into the programming languages, development environments, servers, scaffolding, version control theory, or gemlibraries. The examples are simple but easily scalable. Hooray! The author is someone who can use english correctly and adeptly... and has the technical knowledge I am trying to acquire! This book is not only good but it's complete. A number of other books i've read around the world of Rails do not cover more complex concepts behind associations and testing (!!!!). Michael's writings here not only show how to connect the dots of rails (mvc+more) but the app he builds is interesting and from the start you are doing TDD. I bought this book and read it after already having experience with Rails and still found it super useful. I've also passed emails with Michael when i had questions This book is not only good but it's complete. If you want to learn Ruby on Rails, this book and Agile Web Development with Rails are the books you want to read. 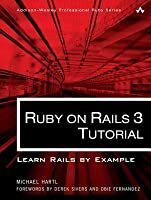 The book takes you step by step through developing a web application and if you follow along, coding as you go, you will gain a good understanding of Ruby and Rails. I especially like the exercises at the end of each chapter that allow you to practice what you've learned and dive in a little bit deeper. A little too specific. I'm not a novice coder, but I'm new to ruby and as I was using a different build than the one in the tutorial I was often lost for no reason other than the fact that the book simply told me to find my own answers. I spent more time googling answers to complete the app then actually reading the book. It's good but not the best. One of the best books for learning rails development I've worked through. In this book you will go over, Rails, Git, RSpec, Bootstrap, PostgreSQL (I believe) and more. By the end you will have created your own Twitter clone application. Book is very well structured. This book is so fantastic I refer to it ALL THE TIME. I've recommended this book to so many people I've lost count. It's also online, which makes it great to have open on my iPad while I write code on my laptop. This is the first web programming book I read. I've learned a lot useful tips and tricks besides rails 3. I think it's a good tutorial book for programmers who have little experience on web programming and Ruby on Rails. We were assigned this tutorial book in my app development and design class. I found it incredibly useful. It is amazing for people just starting out with ruby on rails, and by the end of the book, you end up creating your very own twitter-like application. It's awesome. 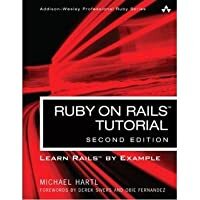 By far the best book for learning Ruby on Rails. Bar none. Really quick and clean way to get you started. Best for beginners like me. great guide to start learning rails. I now feel like I have a foundation to really start building something of my own. A thorough and effective follow-along guide to everything needed to develop web apps with Rails. Definitely planning to re-read the new editions. Read it in two days - gives you the basics, fast and clean. Long, but one of the best tutorials I've ever read. Good way to see what Ruby on Rails is all about, I am still on the fence on whether I like Rails or not. Very basic walkthrough to learn Rails in a weekend that works (if you have any prior programming experience). confusingly, means that I attended Harvard College). I lived in the house formerly known as North, and I worked at the Harvard-Smithsonian Center for Astrophysics. During the summer, I SURFed at the California Institute of Technology. After college, I spent a year studying chaos theory at the University of Maryland, and then I returned to Caltech to get a Ph.D.
in theoretical physics. While at Tech, I was an instructor in the physics core curriculum (Physics 1 & 2) for five years, and received the Lifetime Achievement Award for Excellence in Teaching in 2000. Feynman Lectures on Physics: The Definitive and Extended Edition , an update to the all-time best-selling physics lectures. but our need for additional funding, combined with the risky legal environment created by litigious players unions, led to our decision to shut down in 2005. I then spent the better part of a year writing a web development tutorial book with Aurelius Prochazka called RailsSpace .